When I was a kid, I was a really picky eater. I did what most kids do and declared that I didn’t like things I’d never tried and refused to touch things I knew I didn’t like – like tomato sauce. The only way I would eat pasta, was plain with butter on it. No sauce. Nothing else on it. Just butter. If my mom forgot to set some aside and out sauce on all of it, I’d make her wash it off. I was a horrible kid to feed. 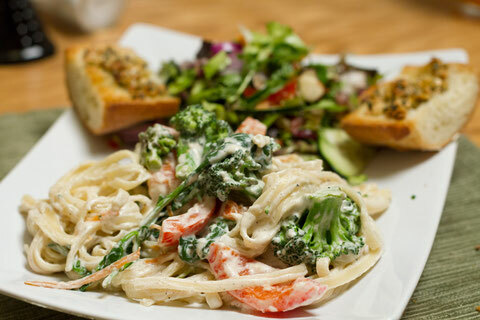 Thankfully, the days of plain pasta are but a distant memory (although, kind of a funny one), and these days, I want my pasta loaded with veggies. The more the better. I thought one of the hardest things to “give up” when we became vegan would be the creamy, gooey sauces I’d come to love in the years since my plain-pasta-only phase. Then I found out about cashews and what can be done with them. Oh happy day! We love this recipe for Black-Pepper Fettuccini with Chardonnay Sauce from Vegetarian Times. I really just used the sauce portion of the recipe this time. It’s an alfredo-style sauce, with lots of black pepper and a little something extra from the wine. I use those little mini-bottles of wine when I cook. That way there’s not a whole bottle opened for just a cup or so for cooking. I don’t drink wine, so it would be a real waste. Anyway, I decided to make a double batch of the sauce. The recipe says it makes two servings, but I wanted to have leftovers because we had a lot of veggies to go in with the pasta. I really could’ve gotten away with making just a single batch, because we had a lot leftover. It was also thicker than I’d meant it to be, because the recipe calls for straining out the solids from the cashews after blending, so you’re left with just the cream, but uh, with a Vitamix, there really aren’t any solids left. Note to self – do not reduce the wine all the way next time so there is more liquid in the sauce. For the veggies, we used broccoli and red pepper I’d picked up at the store, along with spinach and carrots from our Vegetable Husband basket. I also used linguini instead of fettuccini. We made a big salad with lettuce also from the basket we’d gotten on Wednesday, and a batch of Seth’s Eighth Deadly Sin Garlic Bread.